Circa 1905. Built as a private home, this 18-room Greek Revival Colonial mansion has served as a convent, an office, a rooming house and is now restored as an magnificent bed and breakfast. An elegant era is reflected in the coffered, beamed and domed-foyer ceilings, leaded- and stained-glass windows, hand-carved mantels and blend of Victorian and Empire decor. Romantic guest bedrooms feature Jacuzzi tubs and wood-burning fireplaces. Savor a satisfying gourmet breakfast served in the dining room or on the patio. The inn is within walking distance to Narragansett Bay and Roger Williams Park and Zoo, with 230 acres of magnificent gardens, sculptures and historic buildings. Payment Types Accepted Include Discover, Diners Club, Visa, Master Card, American Express, Travelers Checks and Cash. This property has 20 total guest accommodations, 18 with private bath, 3 with fireplaces, 9 with hot tubs. The types of beds available include King, Double and Queen. Flexible check in and check out policies. Period detail with stunning fireplaces and luxurious marble bathrooms with two-person Jacuzzi tubs. Fine linens and beautiful appointments await the discerning traveler. Extensive with garden bronze statuary and bronze water fountain on back patio. This room is decorated with a Mahogany carved king-size poster bed, marble Victorian table, two elegant winged back chairs,victorian couch,and marble shower. Working wood burning Grueby tiled fireplace round this excellent suite. A wonderful king-size cherry sleigh bed with a marble topped Victorian table with two Victorian chairs and beautiful sette. The room has a full bathroom with gilded antique bathroom fixtures, a granite two-person Jacuzzi tub and large two-person shower. The Palladian Room has eight feet Palladian windows, a beautiful Honduras Mahogany king-size bed with romantic scarf and wonderful empire sofa and Victorian chair. This room has a Scottish turn-of-the-century armoire and wonderful matching lion head porcelain French bathroom fixtures.This room has a shower only. 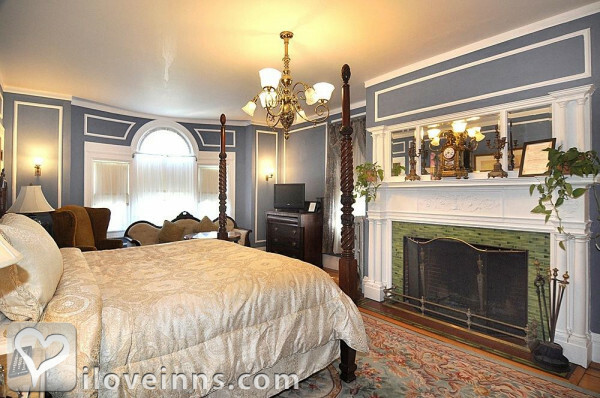 Furnished with a king-size plantation mahogany bed and private marble bath with original Victorian tile. Elegant turn-of-the-century furnishings from historic paneled lamps to comfortable sofas and winged chair make this room one of the inn's most requested room. Once the master bedroom of the house this also boasts of eight feet palladian windows.and elegant wood burning fireplace. This beautifully appointed room has a rice carved king-size four-poster bed with an elegant Victorian sofa and desk. This luxurious and spacious bathroom is decorated with two pedestal sinks, a wonderful two-person tiled shower, fabulous two-person Jacuzzi whirlpool tub and a stereo/CD player. This three-room suite is elegantly and luxuriously appointed with a fabulous four-poster Mahogany king-size bed, full length gilded Victorian mirror, stunning empire sofa, marble Victorian table and two Victorian chairs. There is a full bathroom with a large marble shower and Victorian chair in the second room. The third room is adorned with a two-person Jacuzzi whirlpool tub in carrerra marble, a wonderful settee and CD stereo player. This wonderful room has a very large two-person ultra whirlpool tub, full bathroom in limestone and marble with a beautiful two-person shower and stereo/CD player. A wonderful queen-size cherry sleigh bed, Victorian sofa and Victorian chair. This room is adorned with a beautiful four-poster rice carved bed and sette. The room is complete with a full marble bathroom tub and shower. This room is furnished with a beautiful king-size rice carved bed with a full private bath and Victorian sofa. This two room suite has a wonderful queen-size four-poster rice carved bed and a queen pull out sleep sofa in the adjacent room and an elegant marble full bathroom with a two-person ultra whirlpool tub. Decorated with a king-size four-poster rice carved bed, beautiful period antiques, elegant empire sofa, and refrigerator. The full bathroom has a vaulted ceiling and an original leaded-glass window. 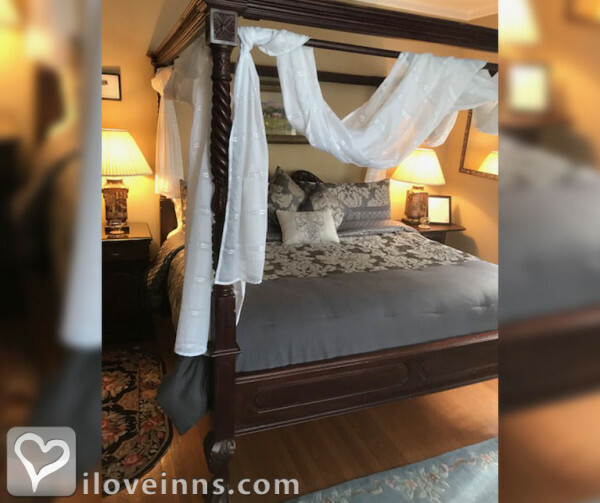 This room has a beautiful king-size four-poster rice carved bed, Victorian sofa, renaissance revival furniture and queen-size sleep sofa and full bathroom with a Jacuzzi tub. This room also has a full kitchen. This is great for medium to long-term stays. The room is decorated with a four-poster rice carved king size bed with elegant appointments.This room is a first floor room. This a two-bedroom suite furnished with a king-size four-poster rice carved bed in one of the bedrooms and a queen-size four-poster bed in the second bedroom. There is a luxurious marble bathroom with a wonderful Jacuzzi tub and large corner shower. This is a two-bedroom suite and is decorated with a queen-size cherry sleigh bed with empire sofa, desk and fainting couch at the foot of the bed. The second bedroom is furnished with a burled walnut full-size sleigh bed and reanaissance revival sofa. The full bathroom is complete with full shower and tub. WE allow overnite stays in the Charle Newhall House. Reservations are non-refundable we may at our discetion issue a future credit depending on the circumstances. There are no refunds for early departures. One of the finest examples of Greek Revival Colonial in America. Historic Roger Williams Park (walking distance) designed by Olmstead, Museum of Natural History(walking distance). Gaspee Point first act of British resistance in the colonies when they burned the British frigate The Gaspee, one mile away. The dates this property will honor the certificate are Monday-Thursday only, not valid May 15-Nov. 15. My husband and I stayed for a week this past summer. We loved the inn, the breakfasts, the owner/chef and the area. recently stayed with a late arrival and L explained the rules,and one was that breakfast is served 8am to 9:30ish...arrived at the dinning room at 9:15 am and gave our order to the server...we were told we were late but they would take care of us,by the chef herself,when the orders arrived they weren't correct,I approached the chef and questioned why my order wasn't correct,she informed me that I wasn't given a choice,the server came in at that moment and I questioned her about my order and she hesitated to tell the truth and finally admitted to a might have...I told the chef that I found her rude and totally out of line...her response,"that's your opinion" with no apology,I'm the customer at $229 a nite and the chef is calling me a liar...don't think so...a side note,bathroom amenities lacking,very old tv,3rd floor walk-up...lacks personal attention all around...staff not customer friendly or attentive...elegant venue with no ammenities and extremely unattentive staff. My fiance and I stayed there for a weekend and it was very beautiful and we loved how everything was in walking distance.We are planning to stay there for our honeymoon. Edgewood Manor was the perfect blend of comfort and elegance. We stayed in the scarlets retreat it had a wood burning fireplace that was so romantic and drop dead gorgeous. The room was lovely and the entire inn was spectacular. The common areas were beautiful especially the library. The breakfast was very good with home made blueberry corn muffins and a delicious omelet cooked perfectly. This was a beautiful inn with gorgeous beds and amazing common areas. the library was co comfy and stately and the music room was awesome with the gilded domed ceiling. We had a great breakfast by Joy in the formal dining room and loved it immensely. This is a must stay when in Providence Rhode Island Much better than a stuffy outdated hotel. So romantic with the real wood fireplace. Wonderful inn and lovely service. When we arrived Rick the innkeeper helped us with our bags. We had a lot of them since we were staying for several nights. We were in the Providence area to visit our daughter. She just gave birth to a new baby girl. We loved our room which had a fireplace and beautiful king size bed. The room was spacious, clean,and comfortable. The breakfasts were different and delicious each day. Wish they were a little earlier but 8-9am worked out fine Joy made coffee at 7 and there was a 24 hr tea and coffee area in the library that was great. The inn was was nice for just lounging an relaxing in the common areas. We will in the spring to visit again and will stay here at Edgewood Manor. Wow! My wonderful wife Gina and I celebrated our 25th wedding anniversary with a stay in the Colonial Room. It was gorgeous. Everything about Edgewood Manor B&B was first rate. Beautiful antique furniture side by side with the most modern comforts. We had tea in the Library. Andy made us a delicious omelet breakfast in the Sun Room. I think that we have started a new annual tradition. What a lovely, romantic place! Go! Enjoy! I rented the inn last weekend for a 15 member family reunion. To see my aunts and cousins walk in and burst into tears of happiness was an incredible moment. The rooms are beautifully appointed; the lit fireplaces (real wood, not gas) and the decorating over the top. We were all treated like princesses, the breakfasts were extraordinary. The staff gracious and attentive. If I could move in, I would! I travel all over the country and always stay in B & B's. The Edgewood is one of my favorites! The rooms are beautiful and extremely comfortable. The owner and innkeepers are wonderful and add to the antique filled ambiance - there is something of interest and wonder in every corner. The little town of Cranston may be overshadowed by close by Providence, but don't overlook it. Then again this Inn is a destination in itself! Don't pass this one up!! My fiancee and I visited the Edgewood Moanro a few weekends ago. It was absolutely the best B&B we had stayed at. The InnKeeper and his wife were very kind and took care of everything and anything we needed. Out room was gorgeous, clean and cozy. The breakfast in morning was delicious and fresh. The grounds were beautiful and the Inn itself was breathtaking. We loved this place so much we thought about staying another night. We will definitely be back to stay in the Samuel Priest room and to visit with the Innkeeper and his wife! Truly a romantic getaway even if it was just for the night!! Little Rhody at its best! The Edgewood Manor presents a wonderful base from which to tour Providence, Roger Williams Park, Pawtuxet Village and the beautiful Narragansett Bay. We couldn't have received a warmer welcome than from our gracious hosts. The rooms are spacious and comfortable, the breakfasts tasty and the overall environment most inviting and hospitable. By the way, I only agreed to write this having secured a pledge from the proprietors to always have some room at the inn for us! ME and my wife were coming to the RI area for a wedding. We researched online different hotels and B&B's and finally decided on Edgewood Manor. It had a look that as very intriguing to us. We booked the Tara suite which was very nice. The grounds were beautiful, breakfast was fresh and the InnKeeper was always pleasant and friendly. We definitely enjoyed our stay here and will be telling others that we know in the area. A beautifully decorated restored mansion that is filled with period antiques. Upon arrival I was warmly greeted by Drew who was more than happy to explain the history of the inn. My stay in Scarlett's Reteat was comfortable and the sunroom was the perfect place for me to catch up on my reading while enjoying my morning coffee. My only regret was that being July it was the wrong time of year to use the fireplace. I will return. Since I live in an Italian Revival house, I figured that I'd feel at home in this Greek Revival inn. The charm and quirkiness of the facility was exceeded only by the professionalism and friendliness of its staff. We can't wait to come back. We stayed for 2 nights at the beginning of July 2014. The main building with the beautiful entrance caught my eye when I booked Edgewood Manor. The room we stayed in did not come even close to how this B&B presents itself. Cracked tiles, rusty heater, defect shower head, defect blinds, extremely loud air condition window unit, ... . Conversations with the owner of the B&B manifested a lack of hospitality. Guests are watched via webcam and maybe even overheard. The location is residential - direct neighbors are CVS and Walgreens with big parking lots at a busy intersection. There is nothing to do, no place to go to, no restaurants or other points of interests. My family and I recently stayed at the b&b and we loved every minute of it. The staff was awesome! The breakfast was great! We enjoyed everything and will be returning soon! I would definitely recommend. My wife and i stayed overnight at Edgewood and we were extremely impressed with the experience. Inn Keeper Ken Porter made us feel at home from the minute we arrived and was very knowledgeable about the property's history and area attractions. The room was amazing and we spent several hours on the patio with other guests. The breakfast was spectacular and highlighted our stay at the inn. We will definitely be returning for another stay very soon. We were looking for a B+B near Downtown Providence and found this place. Our stay was fantastic. The decor and service was excellent. We look forward to coming back. It was the coldest day of the year and we were on the third floor occupying the Colonial Room. To my surprise, the room was toasty warm and the two person jacuzzi tub was a perfect touch to a romantic evening. Breakfast was in the dining room which was as beautiful as the rest of the mansion. The woodwork and tapestry was breathtaking. The breakfast was delicious and the chef/caretaker was very cordial not to mention colorful. I just reserved a room for my daughter and son in law as part of a get away weekend for just the two of them. Just have to say that I've stayed in many Bed and Breakfast all over the east coast and this is one of best it's beautiful clean beautiful antiques it's an amazing place it's like going back in time. I recommend this place to anyone in the New England area a must-see. The manor is breathtaking. The Victorian room was elegant and comfortable. The staff was courteous and attentive without being intrusive. Andrew corrected a billing error quickly. He manages Edgewood Manor with a high professional standard. I hope to stay there again in the future or to have my friends and family experience this restful and high end B&B. I recommend it without hesitation. We drove down from Boston to visit family. Edgewood Manor met & exceeded all of our expectations. Loved walking into a warm inviting space with fireplace going. We had the opportunity to chill out in the fabulous parlors on 1st floor in the afternoon, before retiring to our awesome Samuel Priest room. Really liked the setup of our room and the hot tub was exactly what we needed to unwind. Andy was great in getting us settled and giving us a private and fun experience. The other couple staying at the Manor were great to connect with and socialize as well. We'll for sure stay here next we visit our RI relatives. Thanks again Andy as our experience exactly met our expectations! Rated top 25 inns by McMillan travel guides, Voted most Elegant in America. Featured in Boston Globe (2008), "Best Urban Luxury Inn New England" by Yankee Magazine (2010), Featured on National Geographic (2006), The National Historic Register.